It’s a mark of how my love for journalism–and for people I did it with–has shaped me, that I got up almost immediately to call another journalist friend to discuss. She too no longer works in journalism. 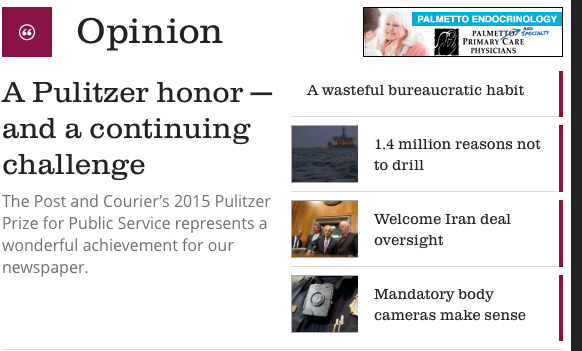 The Post and Courier of Charleston, S.C., with a staff of about 80 and a daily circulation of 85,000, won the most prestigious of the Pulitzer Prizes for journalism awarded on Monday, for a series on the high number of deaths resulting from domestic abuse in the state. Pulitzer coverage is a funny thing: Would these prizes be news worthy of breaking news alerts, prime web-page real estate, and multiple articles if they weren’t news stories about the newspapers? Do the papers even find the right stories within the prize announcements? 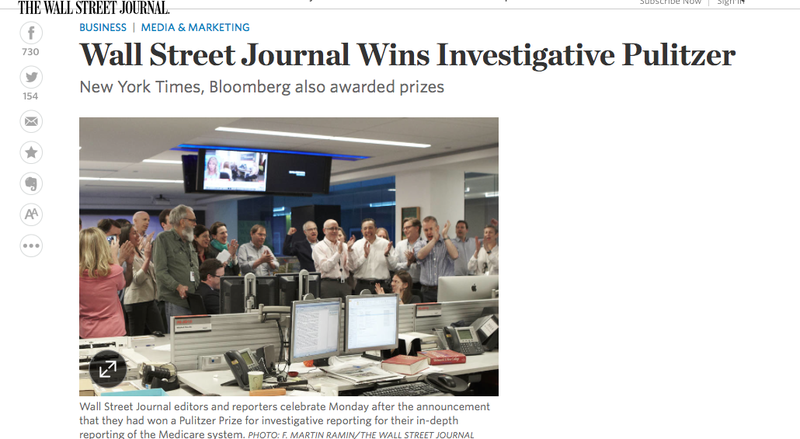 The Wall Street Journal‘s home page headline is “Wall Street Journal Wins Investigative Pulitzer Prize” and doesn’t mention the Post and Courier in the subhead or the first two grafs. Reuters–which does not have its own prize to highlight--led with the New York Times‘ win, even though the Public Service award is the most prestigious. I can almost forgive all this eye-roll-inducing self-congratulation because the print news industry has so little to celebrate these days. But there IS news in this year’s awards: that a newspaper so tiny could win an award so big ( a paper that size has not won in five years, and the Post-Courrier has not won since 1925); that public service was defined as reporting on domestic violence, a topic notoriously under-discussed; that a newspaper did work which was data driven and focused on taking previous years’ reporting to the next level despite a staff of 80. By the time I got to the Post Courier page, the only coverage on the home page was an editorial urging legislative action for restrictions on gun ownership by domestic abusers. That Times’ lede is a lede written by a journalist for journalists. For people who can read that sentence and understand all the implied history of heartbreaking layoffs and fear about the Buzzfeed-ification of journalism. For people who know what it’s like to pray that data analysis will be the panacea of journalism as a whole while also hoping that crunching the numbers will lead to a compelling story about the humans journalists truly want to serve. This year’s prizes offer a second, related story about the state of journalism today. 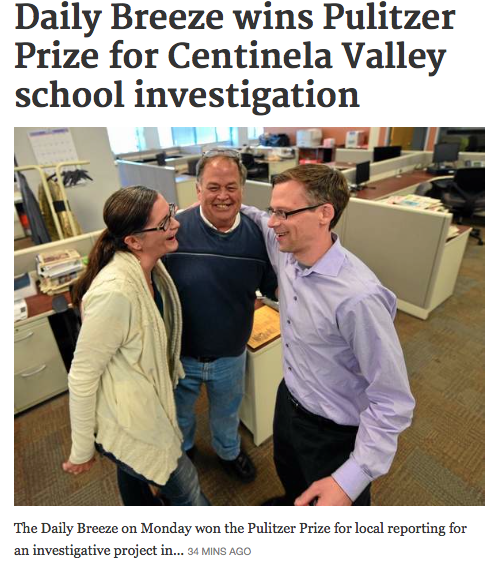 The Daily Breeze won the prize for local reporting “for their inquiry into widespread corruption in a small, cash-strapped school district, including impressive use of the paper’s website.” The paper has seven local reporters. * One of the journalists who won the prize has already left to become a publicist “for economic reasons.” The reality of the business, especially for local journalists, is so brutal that even a shiny prize can’t hide it. But to the small papers everywhere–including the college papers such as my very own–that a small, over-worked staff can still produce great journalism, and perhaps has an obligation to do so (my heart broke a little when I noticed that on a non-print day Spec had fewer news articles than we did on the days we were most ashamed of the product we put out. I get it, but it’s sad). The message “do more with less” is cynical and short-cited when it comes from the business side, but it sounds more like a defense of the value of what journalists do when it comes from the Pulitzer committee and is highlighted by THE newspaper of record and its peers. The Wall Street Journal, Reuters and company should have had the heart to recognize that the Pulitzer Prizes are about more than the big names. They are about the potential journalism still holds, staff and circulation numbers be damned. *Usually, the news events that caused violence or deaths rack up a few awards. The Washington Post, for example, won for its coverage of the Iraq war and for its coverage of the Virginia Tech shootings. The Boston Globe won for its coverage of the Marathon bombings. This year there was some of that–The New York Times won two for ebola coverage, and The Seattle Times won for coverage of the deadly landslide–but notably, the only award for Ferguson coverage was for photography to the St. Louis Post-Dispatch. This entry was posted in Journalism, Pulitzer Prizes and tagged journalism, New York Times, Newspapers, Pulitzer Prize, Pulitzers by leorafalk. Bookmark the permalink.